Good and will recommend to others. Book a private transfer and save your energy for the hike across one of the best preserved sections of the Great Wall of China! 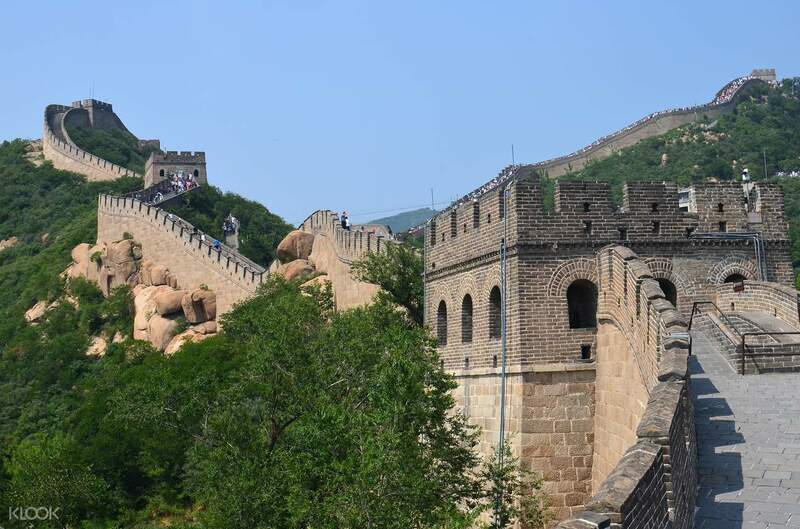 Compared to more popular sections such as Badaling, the Great Wall at Mutianyu is less crowded and is a good destination during hot summer months. This section also boasts of several rare watchtowers, such as Zhengguan Terrace, that are seldom seen along other sections. You’ll be picked up from your hotel in central Beijing early morning and transported to the Mutianyu Great Wall, about 40 miles away, in an air-conditioned vehicle. Upon arriving, you can purchase entry tickets at your own expense and start your Mutianyu adventure right away! This section has been renovated, making it easier and safer to climb, and has also been equipped with a cable car system that caters to senior citizens. You’ll have enough time to explore this magnificent site before the afternoon ride back to your hotel. Great and easy way to get to the wall. Our driver Zhao Wei was friendly and helpful. Offers information readily as I speak Chinese. Would be great if this is a seven hour package as like many other reviews, the to and fro trip will take up 4 hours due to the heavy traffic. Still worth the money as even more time may be wasted if you follow the tour bus that goes around the different hotels before going the the wall. Great and easy way to get to the wall. Our driver Zhao Wei was friendly and helpful. Offers information readily as I speak Chinese. Would be great if this is a seven hour package as like many other reviews, the to and fro trip will take up 4 hours due to the heavy traffic. Still worth the money as even more time may be wasted if you follow the tour bus that goes around the different hotels before going the the wall. Great driver, comfortable car, I was over time about 2hours by went all the way up to the top. The driver is very helpful, even help me to buy ticket for the shuttle bus. Great driver, comfortable car, I was over time about 2hours by went all the way up to the top. The driver is very helpful, even help me to buy ticket for the shuttle bus. I booked this private charter just a day before my trip and was so glad that klook made it possible becase it was so hard to get to the great wall without a private car. My driver does not speak english but we were still able to communicate because he had an app that translates everything that he says. The van was really new and clean. The driver was also on time so make sure that you finish the trip within 5hours so that you won’t pay extra. If ever the driver offers you to visit A jade or tea store, you might want to skip it especially when you are on a tight budget because you will feel obligated to buy from them. I booked this private charter just a day before my trip and was so glad that klook made it possible becase it was so hard to get to the great wall without a private car. My driver does not speak english but we were still able to communicate because he had an app that translates everything that he says. The van was really new and clean. The driver was also on time so make sure that you finish the trip within 5hours so that you won’t pay extra. If ever the driver offers you to visit A jade or tea store, you might want to skip it especially when you are on a tight budget because you will feel obligated to buy from them. We arrived late Friday and did this Saturday morning as we didn't want full day. Half day was perfect amount of time, basically a private taxi with the two of us and one driver who was very flexible. Great option! We arrived late Friday and did this Saturday morning as we didn't want full day. Half day was perfect amount of time, basically a private taxi with the two of us and one driver who was very flexible. Great option! Amazing experience. Drive was very friendly. he came on time for pickup. We very lucky that he knew some english too. Amazing experience. Drive was very friendly. he came on time for pickup. We very lucky that he knew some english too. The driver is very patient in waiting us. But we paid for extra for the additional time. Driver speaks no english at all. Translator app is a must. The driver is very patient in waiting us. But we paid for extra for the additional time. Driver speaks no english at all. Translator app is a must. Our driver was very nice and friendly and very accommodating. This is a good value deal And would highly recommend it. Our driver was very nice and friendly and very accommodating. This is a good value deal And would highly recommend it. Our driver 赵伟 was a gem! He was nice and polite, chatty, and gave us alot of tips about touring Beijing. He would also tell us about the small towns, their speciality food when we pass by. It is also pretty definite that you'd exceed the 5hrs given by kloow so be prepared to top up for the time extension. we gladly paid our driver since he was so nice. Our driver 赵伟 was a gem! He was nice and polite, chatty, and gave us alot of tips about touring Beijing. He would also tell us about the small towns, their speciality food when we pass by. It is also pretty definite that you'd exceed the 5hrs given by kloow so be prepared to top up for the time extension. we gladly paid our driver since he was so nice. Overall, excellent service by Mr. Chang! We were picked up at the hotel on time. Mr. Chang was very friendly, polite and professional. Throughout the entire trip, he always makes the effort to ensure that we are comfortable. He speaks very little English, but that was no problem because we were able to communicate via a translation app. Highly recommended! Thank you, Mr. Chang, for the wonderful service! Overall, excellent service by Mr. Chang! We were picked up at the hotel on time. Mr. Chang was very friendly, polite and professional. Throughout the entire trip, he always makes the effort to ensure that we are comfortable. He speaks very little English, but that was no problem because we were able to communicate via a translation app. Highly recommended! Thank you, Mr. Chang, for the wonderful service!